Checking equipment in the springtime can reduce money and time spent on future maintenance repairs and ensure a safe and comfortable season. Update preventative maintenance plan. Establish and update maintenance routines with your facility teams each year to ensure equipment is running at peak efficiency. Create a maintenance checklist so tasks are completed strategically throughout the year. Check HVAC equipment. Clean and replace air filters per manufacturer recommendations. Remove any debris that has accumulated near outdoor equipment. 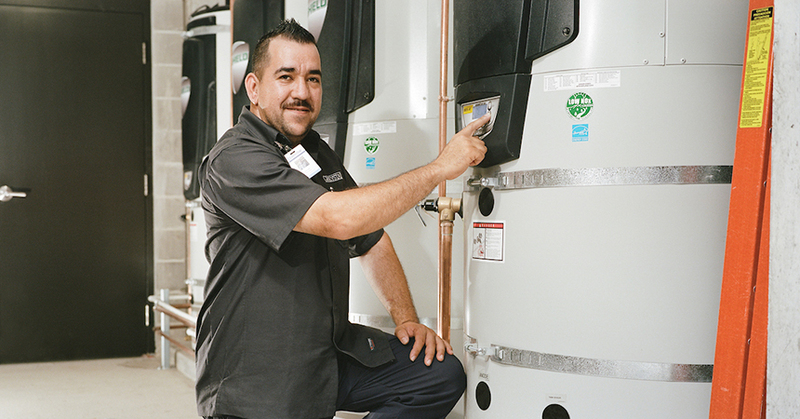 Inspect water heaters. Drain water heating tanks once a year to keep silt or sediment from accumulating. This helps to improve the longevity and performance of the unit. Look for water damage. Check door and window seals for openings, as well as washing machines and sinks. Signs of water damage include discoloration and change in texture. If leaks are left unfixed, they can lead to water damage and mold issues. By inspecting all interior and exterior systems, property managers can assess any damages caused by winter weather and prepare for upcoming summer weather, helping save time and money in the long run. If repairs are needed, Energy Trust can help you find a trade ally contractor to assist with equipment repairs and upgrades. Contact Energy Trust of Oregon for more maintenance tips and incentive information. Call 1.877.510.2130, email multifamily@energytrust.org or visit www.energytrust.org/multifamily.